Studio Eleven 11: Do you know the best times to list/relist your Etsy items? Easily find out with Google Analytics! Do you know the best times to list/relist your Etsy items? Easily find out with Google Analytics! As Etsy sellers, we all know that being successful is part luck and part planning. Today I'm writing to help you with the later--planning. Whenever I list new items, I always see a surge in traffic. But what times are the best times to list? When will I get the best bang for my listing buck? Luckily, if you have Google Analytics installed on your site, you can answer this question easily. 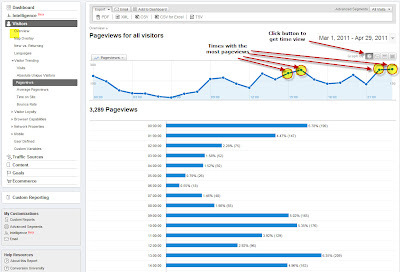 If you don't know what Google Analytics is or how to install it, see here. 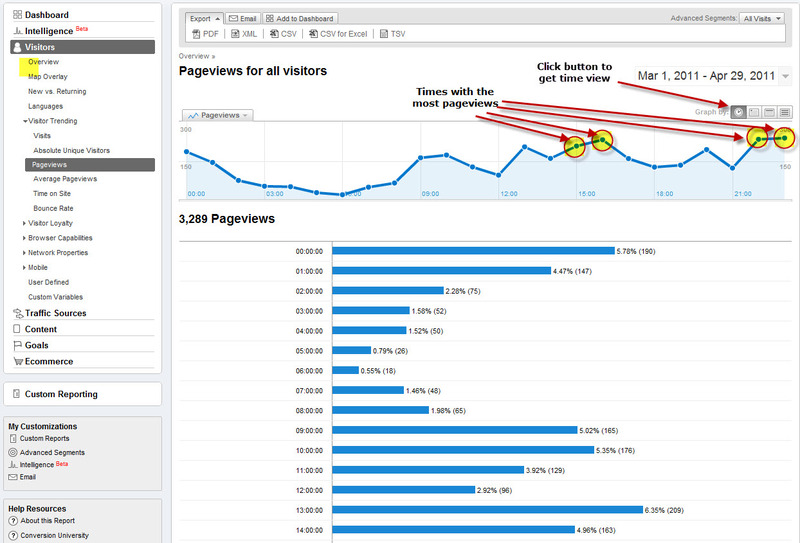 Log in to Analytics and click the "Visitors" dimension. Then click the "Visitor Trending" drop down and click "Pageviews." Set your time range in the upper right corner. Make sure your time frame is substantial--at least a month. Also keep in mind special occasions, like Christmas, that might skew your data. Now click the little clock icon. This will give you a 24 hour chart and plot pageviews. Find the peaks. You can do this visually or use the Export option. (Export to Excel and sort page pageviews.) See below for an illustration. Click to enlarge. Image will open in a new window. Write down the hours that have the highest pageviews. These are your prime hours. For me, its 3pm, 4pm, 10pm, and 11pm EST. Depending on your time zone and region, yours will differ. Now list! Simple. Easy. Actionable. Use this info to make your shop succeed. Good luck! What a fabulous and informative post. I've studied Google Analytics quite a bit, and have come up with some useful info but this post and it's information is the most useful to me so far!